What music are you using during the makeup application?? what did u use for music? Can I make this before hand and then jus apply it to ur face when needed? How did you make the slamming part real????? If I did that and someone was staring at me, I'd be like: "Why are you looking at me like that? Do I have something in my face?" That could be quite funny. I really want to try this, but how do you cut the can in the first place? How do I remove the can + latex afterwards? I'd love to try this! 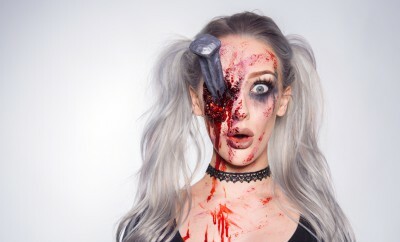 I'm totaly gonna do this for halloween! Do i need to make it ?! sorry. that wasn't a soft drink! She looks like a barbie in 03:41 . SOOO GORGEOUS! Love your works! uuuuuuuuu se par ese real. I bet your supost to see out of the part were you drink out of.....????? I, too, get bored and shove a can into my eye. Do the gory can in foot. Macs: Ellinor! I bet you can't shove this can in your eye! Ellinor goes in the bathroom, all the makeup time is quote on quote' "preperation". Ellinor comes out of the bathroom can and all. Macs: OH JESUS CHRIST ELLI! I DIDN'T MEAN IT! I'M CALLING 911! Elli whispers to herself,: Oh god,no. this should have been titled "eye can"